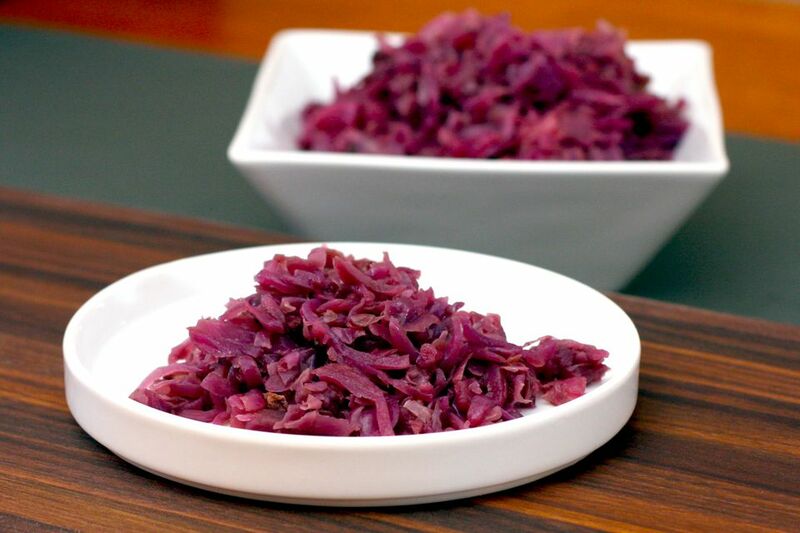 Nutritious red cabbage is flavored with cooked diced bacon, tart Granny Smith apples, and seasonings. Use turkey bacon to keep the dish low in fat. I like caraway seeds in this dish but they can be left out if you aren't a fan. Also, the red wine can be replaced with more beef stock. This cabbage makes a nice side dish to serve with pork chops or a pork loin roast. The cabbage would go well with steaks as well. Add onions and saute until softened, about three minutes. Add the garlic and cabbage, the vinegar, sugar, pepper, chopped apples, bacon, wine, and beef broth. Bring to a simmer, reduce heat, and cover. Continue cooking for 30 to 45 minutes until cabbage is tender. Taste and add caraway seeds and salt, as desired. A mandoline makes shredding cabbage and other slicing tasks super easy. Or use a food processor with the slicing disk.